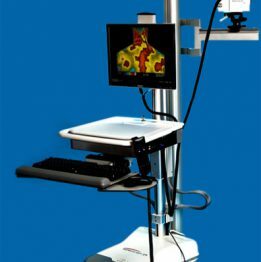 Indications for use: The Spectron IR Clinical Infrared Imaging System is intended for adjunctive diagnostic screening for the detection of breast cancer and other uses such as: peripheral vascular disease, neuromusculoskeletal disorders, extracranial cerebral and facial vascular disease, thyroid gland abnormalities, and various other neoplastic, metabolic and inflammatory conditions. The Spectron IR interface and operations software provides the confidence needed to quickly capture, store, retrieve and analyse images. Temperature reference points, temperature differentiation, isotherms, area temperature averaging, colour palette choices and so much more are all accomplished with highly efficient single keystroke commands. This greatly reduces the time that is spent looking for drop down menus, choosing from the menu and then clicking on that choice to initiate a command. Intuitive Design: The Spectron IR software uses the most common sense and simple method for commands. This translates into an incredibly easy to learn system. Feedback from technicians and experts in medical thermography has noted that this is one of the easiest, straight-forward, and efficient software designs they have ever worked with. Single Keystroke Command: This allows users to quickly capture, store, retrieve and view any image using a simple keystroke command. By eliminating nearly all drop-down menus valuable time is saved in both capturing and analysing images. The Spectron IR software was created from the ground up to be medical specific and is designed for highly efficient clinical applications. The Spectron IR post-image processing utilises a sophisticated, yet interface simplified approach. While maintaining single keystroke commands, a mouse is also used to initiate certain analytical processes that allow for efficient topographical mapping. Each image is presented in its own frame with all of its radiometric data. 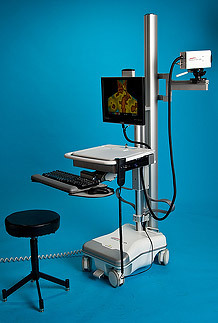 This allows for an individual image to be analysed while being able to view up to 16 images on a single screen. The thermologist may choose among 20 differing colour and grey scale palettes while simultaneously performing a quantitative temperature analysis. A quick digital subtraction may also be done in two forms by simply hitting a single key. Pinpoint, two-point, and area averaging temperature analysis along with arrow coding and annotating are just a few of the many other methods of analysis available to the thermologist. For those who don’t want to use presentation software such as PowerPoint, the Spectron IR software also allows you to build a presentation database of images. These images may be used in presentations or extracted as high-resolution images in one keystroke. The extracted images may be used to build websites and promotional materials such as brochures. We have covered just a few of the main highlights of our interface, operations, and post-image processing software. To fully appreciate the power of this software, and a complete review of all of the features, please feel free to call for a demonstration. IR Distributions © All Rights Reserved.